OKLAHOMA CITY (Nov. 1, 2017) – In an online vote, Oklahomans selected a Latta High School student’s watercolor painting of a vintage schoolhouse at sunrise as the design of a new specialty license plate to support education, State Superintendent of Public Instruction Joy Hofmeister announced Wednesday. Sarah Skaggs, a high school junior, based her artwork on the Jones Chapel Schoolhouse in Wintersmith Park in Ada. The historic one-room structure was built in 1907 – the same year Oklahoma became a state. The Oklahoma State Department of Education (OSDE) received nearly 800 entries from students across the state for its License to Educate art contest, then narrowed the entries to six finalists. A total of 16,549 votes were cast online in the two-week contest period. Sarah, who plans to pursue a career in forensic art, created several versions of her painting before she submitted it to the contest. “This was not my first draft, trust me. It takes time to be better, and I learned it won’t always be right the first time,” she said. Beginning today, the specialty tag (plate code LE) is available for pre-order at tag agencies across the state or by visiting here. 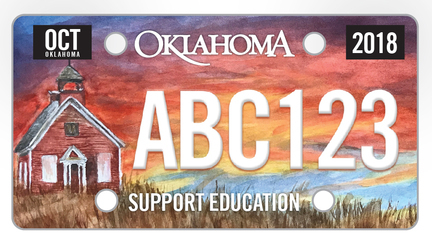 The license plate sells for $35 (plus an additional $3 mailing fee), with most of the proceeds helping to recruit and retain teachers in Oklahoma. The Oklahoma Tax Commission must receive 100 pre-orders by May 1, 2018, to put it into production. The plate is the result of a recent state law authored by Sen. Stephanie Bice and Rep. Ryan Martinez aimed at curbing the state’s teacher shortage. Jenny Salter, who has taught art at Latta for seven years, urged Sarah to enter the contest because she thought her 11th-grade student had the talent and determination to create a work of art that would resonate among voters. In addition to working with watercolors and graphite, Sarah is the graphic design editor of the school’s online newspaper. Hofmeister applauded the efforts of participants.